Over the last year more of our clients have utilized private jets for pet relocation to Hawaii from the mainland U.S. with much success that has eased the stress on both pets and their owners. Via our partnership with Le Bas International, we have been successful at finding empty legs or one way pricing for our clients that has lowered the cost considerably as super-mid sized or large private jets are needed to make the over water flight from the west coast. While aircraft charter for relocation to Hawaii can still be expensive for those who want to fly privately, Pet Jets Travel Club is another option for those who might be interested in sharing a flight with other members that can lower the cost considerably. According to Pet Jets founder and CEO Brian Fiske, “many large private jets that are needed to cross the pacific to Hawaii have seating for 9 or more passengers. 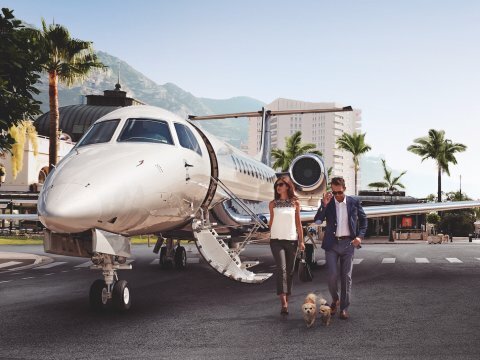 For a couple and their one or two dogs there is plenty of room for a similar party and sharing the cost and saving 50% can be a considerable amount of money.” Individuals interested in pet location aircraft charter to Hawaii can simply contact Pet Jets 24/7 at +1.714.367.4028 or via email at info@petjets.com for a non-obligation quote. Pet owners should also know Hawaii is a rabies free state. Hawaii’s quarantine law is designed to protect residents and pets. All dogs and cats, regardless of age (puppies and kittens included) or purpose, must comply with Hawaii’s dog and cat import requirements. For more information, visit The Hawaii Department of Agriculture’s Division of Animal Industry page.